“productive friction”…allows people to disagree with each other respectfully in the search for the best solution. Failing faster and smaller at the process level can enable an organization to learn from mistakes and continue to move ahead. Putting together teams that work together well may, in fact, may be more important than hiring superstars. Recognizing the need for change and developing a clear vision of where the change should lead are important steps in bringing about an institutional transformation. And having a committed, charismatic leader is helpful. But while these elements are necessary, they are rarely sufficient to ensure success. Ann Pendleton-Jullian, architect and Professor at the Knowlton School of Architecture, Ohio State University, has studied and written about the transformation of JSOC by General Stanley McChrystal. 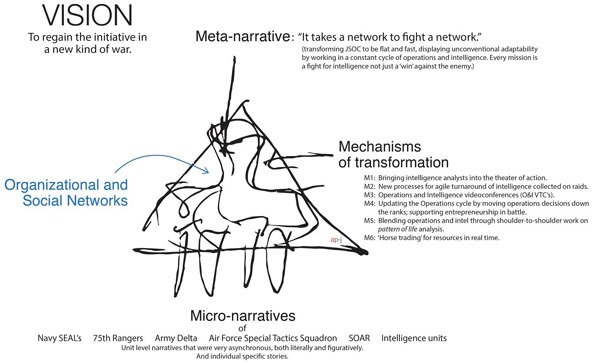 In fact, the story of this transformation, based on extensive discussions with General McChrystal and several of his direct commands, is told in a forthcoming book, Design Unbound: Designing for Emergence in a White Water World by Pendleton-Jullian and John Seely Brown.1 Using a conceptual framework that she calls the Change Triangle 3.0, she “unpacks” the elements of McChrystal’s story in terms of the strategies and methods that he used to accomplish his goal of transformation. The process begins with a vision, a high level statement of the change that a leader wants to achieve. In the case of JSOC, the big vision was the goal of regaining the initiative from the enemy in what was, and is, a fundamentally different kind of war, which meant learning to fight in a different way. This goal may sound simple, but the process of getting there was not simple or even knowable when McChrystal took command in 2003. It required a deep understanding of the context, both external and internal, in which JSOC operated. To understand the external context, McChrystal spent time with his troops, going with them on missions to see first hand what was happening in the field. He soon realized that the nature of the insurgency had changed radically. Rather than being structured in rings of command, with a leader at the center and decentralized, semi-autonomous cells around him, as had been the case in the past, the enemy had evolved into being a network of multiple dispersed actors— “a network of networks” with no center at all. It was also changing and adapting faster than his organization could react. Equally important was understanding the internal context, the way that JSOC was organized. McChrystal knew that the various special operations troops that made up JSOC—Navy SEALS, Army Delta Force, Army Rangers, Air Force Special Tactics Squadron, SOAR, and the intelligence units—were essentially a series of “tribes” with their own traditions, stories, ways of operating and even languages that bind them together as fighting units. Their focus was on executing discrete operations. To maximize the chances for success, missions were carefully planned, which increased their effectiveness but limited the number of operations they could carry out. But the biggest problem he saw was structural: the “hourglass” shape of the organization, with the operatives in the field carrying out their missions and collecting large amounts of potentially valuable intelligence information on one side of the hourglass, and on the other side, far away from the action, command and the analysts who received the information and turned it into what was supposed to be actionable intelligence. The large gap between these two key groups all but insured that by the time the intelligence could be fully analysed, it was out of date. In addition, the large geographic gap between the two groups as well as their cultural differences made effective communication between the two cumbersome and slow. 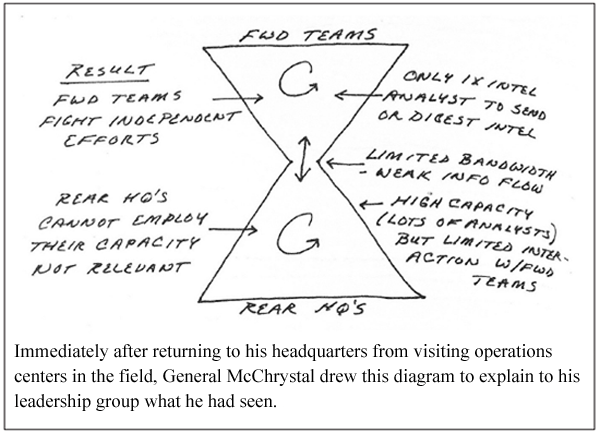 It was not long before McChrystal concluded that “it takes a network to fight a network.” To accomplish his vision of regaining the initiative, he would need to transform the hourglass into a flat and fast operation that would display unconventional adapability by working in a constant cycle of operations and intelligence. Every mission should not be just a “win” against the enemy but a fight for intelligence. Pendleton-Jullian characterized this as McChrystal’s “meta-narrative,” a large story that communicates the vision to the organization in a way that is emotionally compelling but broad and ambiguous enough that it can be adapted and used by everyone. The meta-narrative enables all levels of an organization to share a compelling goal rather than merely being subjected to a strategic plan. In doing so, it inspires participation in trying to get there. But as a story and not just as a “goal,” a meta-narrative needs to provide corollary texture. Their mission was no longer a task to be carried out but a problem to be worked. Their mission was no longer just about shooting, but about fighting to get actionable intelligence in a context in which intel had a rapidly decreasing shelf life. For these high level messages to be effective, they had to resonate with the micro-narratives that belonged to the different units. Micro-narratives are held by the guys on the ground, as individuals and as “tribal” groups. McChrystal had to understand his ops and intel guys. To effect change, he needed to know their stories and tribal narratives that express identity, purpose and practices, that motivate and ultimately drive and define actions. In addition, McChrystal had to have a good understanding of the organizational and social networks that tied his group together by transferring stories, supporting actions, and generally driving the organization and its culture. The actual process of transformation took place through a set of “change mechanisms,” which Pendleton-Jullian defines as “anything that does work in the system.” General McChrystal tried many different mechanisms to change how JSOC operates. If they didn’t work, they stopped using them; if they worked, they improved them. In the end, through a process of trial and error, there were less than a dozen critical ones. Some of the mechanisms already existed in different forms, but were adopted for use with JSOC. Pendleton-Jullian stressed that these mechanisms did not work alone. Rather, McChrystal was able to achieve monumental results precisely because of the way these mechanisms interacted with and supported each other. As new, more agile processes shortened turn around time for intelligence analysis, it became possible to speed up the pace of operations. Over time, the number of operations that JSOC could carry out increased from 10 a month to 300 a month. At the same time, the focus of operations shifted from eliminating the enemy to fighting for intelligence that allowed them to fight smarter and more effectively. One of the most dramatic and visible mechanisms for change was the introduction of a daily operations and intelligence video teleconference (O&I VTC) that was open to virtually anyone in the military with an interest in what was happening in JSOC operations, from top leadership to unit leaders in the field. Over time, these VTCs grew to include an audience of several thousand people both in the field and back in the U.S. The purpose of the VTCs was to enable everyone to understand what decisions were being made and why. While not everyone could participate actively in these VTCs, everyone could watch the process of leadership in action, which created a “shared consciousness” that had not previously existed. McChrystal noted that he did not try to “democratize the strategic decisionmaking process,” and did not cut leaders out of the decisionmaking process. Rather, the VTCs democratized information about decisionmaking by openly sharing information about what was going on. The process also made failures more visible, which encouraged accountability and greater initiative-taking by frontline troops by demonstrating that failure was not being punished as long as it was not the result of negligence. As intel and ops worked together shoulder to shoulder, what were very separate tribes with different values, cultures and perspectives were transformed into close-knit teams who understood each others’ needs and shared a common set of goals. Together, they learned how to carry out what were called “pattern of life” analyses that could spot small but meaningful changes in the day-to-day activities of their targets. In summarizing his experience, General McChrystal noted that when he took over JSOC, it operated like “a very specialized sub-contractor” that took on well-defined tasks and carried them out incredibly well. The organization was also highly risk averse and wanted to do everything possible in advance to avoid failure. But while it was “comforting” to focus on targets that could be taken out, the problem was that they were fighting a network that kept changing, and they needed to learn how to change and adapt even faster than the enemy. In essence, McChrystal had recognized the need to transform his fighting force to function in a whitewater world of constant, rapid change. Although General McChrystal’s story represents a singular accomplishment, Roundtable participants cited several non-military examples that reflect some of the same elements of Pendleton-Jullian’s change triangle. Heather Rangel noted the importance of radical transparency at one of her clients at Deloitte. Every Friday afternoon, the company holds an all hands meeting led by the founder who is committed to answering any question from any employee. Questions are not submitted in advance. Like McChrystal’s JSOC, Rangel’s client operates “flat and fast.” Also like JSOC, the company has pushed decision-making down the ranks. Big decisions are made by managers, and multi-million dollar contracts may be signed by someone with five years of experience with the company, which is part of what has enabled the company to double in size in a relatively short period of time. Rangel’s client’s unorthodox ways of doing business can be challenging for more traditional firms like hers. The client made it clear to Rangel that it did not want to see “shiny shoes” from her firm showing up or to negotiate contracts with senior partners, but rather with the people who would actually be doing the work. Peter Marx commented on the parallels between how McChrystal organized JSOC and how online communities operate. He cited the example of the massively multiplayer online game (MMOG) Worlds of Warcraft (WoW), where he had been Chief Technology Officer. The game is organized around a series of quests carried out by members of guilds that involve as many as 100 players. They would get together before hand to plan their quests, carry it out, then reflect on what they learned. Individual reputations were directly based on personal accomplishments. John Seely Brown, who has written extensively about WoW, added that a key to success in the game is the use of dashboards that players maintain to track their accomplishments. By sharing dashboards in after-action reviews, players benefit from providing their own radical transparency. Peter Hirshberg described a project that he did with Best Buy that made use of social media to bring about an internal transformation among the company’s 144,000 employees. It turned out that a large number of employees wanted to use a social network that was originally created to support a campaign around selling home theaters. As it evolved, the network was used to solve both internal and external problems. For example, when the HR Department wanted to increase participation in the company’s 401(k) plan, the network was used to run a contest for the best video that explained why employees should join the plan, which resulted in a rise in participation from 18 percent to 47 percent of the staff. This success generated confidence that it was possible to solve problems by letting employees themselves create the media that spoke to other employees. When the company realized that their customer portal “was awful,” they ran a contest online to build a better portal, which was completed in 48 hours. In fact, solutions often came from unexpected sources. The person who ended up leading the company’s transformation effort had previously been creating store endcaps. Hirshberg explained that the best way he found to explain the need for change to Best Buy’s employees was to use a memo that had been created by the Central Intelligence Agency to explain that in order to respond to constant rapid change, it needed to become an emergent adaptive organization. Hirshberg added that the most important thing that the Chief Executive Officer did in supporting the company’s change effort was “to keep the team from being shot” by resisters. General McChrystal acknowledged that corporations do not have the “every day immediacy” that exists on the battlefield and that corporate hierarchies are often designed to insulate executives from the consequences of their decisions. But he pointed out that it was not clear for some time whether his troops were winning or losing the war. Change does not happen by just putting in place a mechanism and letting it run. Rather than getting heavily involved in the nuts and bolts of daily operations, his focus was “on making the right conversations happen,” and when that happened, then the right things happened. In fact, after the first year and half of his command at JSOC, he made almost no decisions other than where to put talent in his organization. Eddie Lampert, Chief Executive Officer of ESL Investments, noted that everyone “wants to feel in control of something,” and that people get worried about their jobs when they begin to lose control. How can a leader get them to buy into change that may be disruptive? And how do you deal with senior people who are not comfortable saying, “I don’t have the answer”? In transforming JSOC, senior leaders were not cut out of responsibility, though, according to McChrystal “key leaders discovered that they weren’t always as key as they thought.” Information was democratized so it was more widely available, and examples were deliberately set up that let everyone see that what was being said was not punished. When an organization becomes “radically transparent,” failures become obvious. LiveOps, which supplies companies with teams of remote support and customer service agents over the Internet, provides every employee with a personal dashboard that allows them to track their work. The result has been large improvements in performance. Intuit, the provider of financial software and services, relies on the use of “experimentation platforms” to reduce the risk of failure. All parts of the organization—sales, marketing, services—are expected to use a process of “rapid experimentation” to test new approaches and new product offerings, and every employee is expected to be experimenting all of the time. Li & Fung is a Hong Kong-based firm that coordinates an international network of small apparel manufacturers to serve the needs of large fashion companies globally. By modularizing the production process, it creates space for suppliers to test, experiment and improve processes. Rather than building a tightly integrated supply chain, which presumably would maximize efficiency, Li & Fung allows producers the freedom to try new approaches if they can meet requirements that exist at the interfaces between the nodes on the network. Recognizing that more diverse teams lead to more creative solutions, companies are using matching algorithms to build more productive teams. Ann Pendleton-Jullian pointed out that even in a whitewater world, where rapid improvisation is a necessity to respond to a continually changing environment, different skills are needed: in addition to the person in the kayak who must navigate through the rapids, successful teams also need a kayak maker who can make use of technology to build a better kayak and perhaps an observer on the bank who can identify the places where trouble occurs and devise better strategies for getting through them. Another powerful technique for moving toward exponential operations is a relentless focus on performance improvement. This requires tracking more than just financial results but metrics for operational performance that can lead to and support deep reflection on how to improve. Turning back to the public sector, the participants considered the complicated issue of domestic policing and the extent to which lessons from the military did or did not apply. While there are some obvious parallels between the two types of organizations and activities, one major difference is that the application of force is a primary tool for the military, while the use of force should be a last resort for police. Alaina Harkness raised the question of how well McChrystal’s goal of increasing the pace and volume of operations would translate to a domestic setting. There may be value in having an increased police presence in a community, but what will matter most will be the quality of interactions with the community. McChrystal replied by explaining that their ultimate measure of success was the quality of the intelligence that they gathered and how it could be put to use. The real key was how all of the individual bits could be put together to give them a big picture of what was going on. The most fundamental change was cultural: by bringing the analysts closer to the action (including allowing them to be connected to raids by video), they were made to feel that they were part of the action, which greatly increased their effectiveness. Harkness responded that a focus on the value of intelligence could be “a real way forward” in applying the lessons of JSOC to the world of policing. Better data collection could yield greater transparency. She also noted that although the idea of community policing has been around for a long time, it has “never been given a fair shot.” But identifying new metrics and new strategies could be transformative. Peter Marx shared a story from his time as Chief Technology Officer of Los Angeles about the introduction of body cameras for police that spoke to the reality of unintended consequences. Shortly after the cameras were deployed, two officers were dispatched to respond to a domestic violence call, which can be difficult to handle because of the emotions that are involved. When the officers pulled up in front of the house, “it erupted with people yelling.” But when the cops explained that they were wearing body cameras that were recording everything that was going on, everyone quickly calmed down and became more rational. While the initial goal for body cameras had been to increase transparency, particularly in disputed situations, their presence also led to better behaviors and better overall outcomes. Ann Pendleton-Jullian concluded that what was particularly impressive about General McChrystal’s transformation of JSOC is that it ran against the tides of so much of the military. His success was a result of having a clear view of the context in which change could happen, then crafting an effective meta-narrative and then finding specific mechanisms for effecting change. The critical challenge is to find the right mechanisms, then putting them into action, realizing that (as in the case of the body cams in Los Angeles), they may lead to an unanticipated outcome. 1 Ann Pendleton-Jullian and John Seely Brown, Design Unbound, Designing for Emergence in the White Water World, MIT Press, forthcoming.